A comprehensive new study of the Hindu Kush Himalaya region, known as the world’s “Third Pole” for its vast store of ice, and home to Mount Everest and K2, is warning that a 1.5 degree increase in global warming would melt one-third of the region’s glaciers, while a 2 degree rise could melt half the glaciers in the region, destabilizing Asia’s rivers. The study finds that even the most ambitious Paris Agreement goal of limiting global warming to 1.5 degree by the end of the century would lead to a 2.1 spike in temperatures and the melting of one-third of the region’s glaciers, a critical water source to some 250 million mountain dwellers and the 1.65 billion others living in the river valleys below. 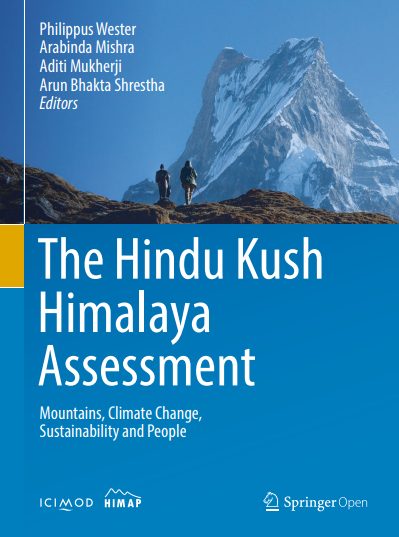 Although the climate of the Hindu Kush Himalaya (HKH) has changed significantly in the past, it is projected to change more dramatically in the near future. Regional warming continued even during the global warming hiatus – the period between 1998 and 2013 when global warming appeared to have slowed. Current emissions would lead to 5 degrees warming and loss of ⅔s of region’s glaciers by 2100. 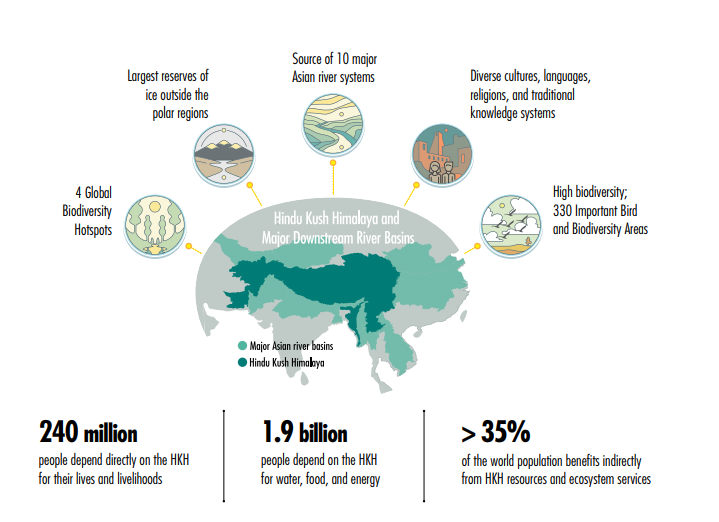 The HKH region covers 3,500 kilometers across Afghanistan, Bangladesh, Bhutan, China, India, Myanmar, Nepal and Pakistan. 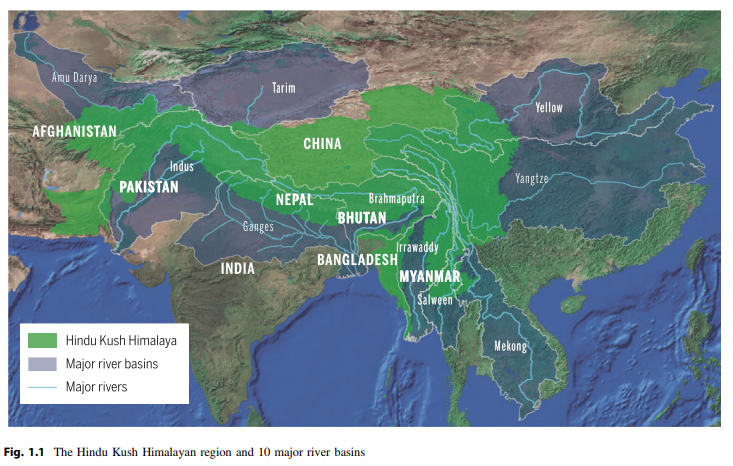 Glaciers in its record-breaking peaks feed 10 of the world’s most important river systems, including the Ganges, Indus, Yellow, Mekong and Irrawaddy, and directly or indirectly supply billions of people with food, energy, clean air and incomes. Glaciers in the Hindu Kush are extremely sensitive to the changing climate have steadily thinned and retreated s ince the 1970s, when global warming first set in, while snow-covered areas and the amount of snow have decreased. The changes have had ripple effects felt throughout the region. Changes to the timing and magnitude of melting leads to an increase in the number and size of glacier lakes, which can suddenly flood. This can lead to a surge of glacier runoff into major rivers, which could lead to flooding and the destruction of crops. Greenhouse gases are exacerbated by air pollutants originating from the Indo-Gangetic Plains—one of the world’s most polluted regions. The pollutants deposit black carbon and dust on the glaciers, hastening their melting and changing monsoon circulation, and rainfall distribution over Asia. The changes hit the region’s poor hardest – about one-third of the 250 million HKH mountain people live on less than $1.90 a day; more than 30 percent of the region’s population doesn’t have enough to eat, and around 50 percent face some form of malnutrition. The report argues that challenges facing mountain regions will only get worse with climate change and glacial melt.